How can I be a guest on my own blog, you ask? Over the past few weeks, with the publication of Bird in Hand, I’ve been busy guest blogging for other sites and doing Q&A’s, radio interviews, and podcasts. (And more are coming up.) Now and then, if a particular posting or discussion strikes me as pertinent to issues here, I’ll post it as well. Hence my own guest blog. 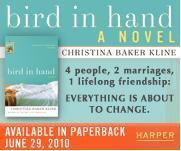 Bird in Hand is about a car crash that changes the lives of four people. But what’s it really about? That’s a good (and hard!) question. At one point in the book a character wonders, “Who breaks the thread, the one who pulls or the one who hangs on?” I wanted to write about love and loss and betrayal and renewal. I wanted to write about characters who don’t know quite what they want, or how to get it, and are pushed into decisions by circumstances beyond their control. One of my epigraphs is a quote from The Age of Grief, by Jane Smiley: “Confusion is perfect sight and perfect mystery at the same time.” This holds true for all of my characters in different ways. Why do you write both novels and non-fiction? Writing novels is my passion, but writing is, by definition, a solitary pursuit. Another side of me wants to be out in the world, interacting with people and exchanging ideas. All of my nonfiction books have been, in a sense, collaborations — I wrote a book about feminist mothers and daughters with my mother; I’ve edited or co-edited four essay collections. I realized the other day that my own blog on writing fulfills this social/intellectual need. I can share my thoughts about writing with other people, and work with guest bloggers on their own ideas. I love doing it. You are Writer-in-Residence at Fordham, have three kids, and write novels. How do you balance it all? I rarely feel that I achieve balance. What I’ve learned over the years is that sometimes things will be out of balance, and that’s okay. Sometimes I don’t have time to work on my fiction (like now, while I’m in London teaching and working on nonfiction articles and interviews). And sometimes I’m focused on my family and just want to be in the moment with them. I’m not sure whether it’s my nature or whether I’ve learned to do this because I have a complicated life, but I’m pretty good at hunkering down and working on my novel when I need to. When I’m consumed with writing, other parts of my life suffer — laundry piles up, for example, and we do a lot of takeout. My family is pretty understanding; they know it’s all part of the process, and will be over before long. They all have their own passions as well. In my senior year of college a visiting novelist took my short stories to her literary agency, and a young agent (Beth Vesel, who is still my agent) called me up and said she wanted to represent me. This gave me confidence at an early age — the idea someone believed in me and cared about my work. Though I know this is pretty unusual, and I was lucky, I always tell my students that what’s most important is that they find someone — a mentor if possible, a friend, even a parent — who believes in their work and encourages them to move forward. After college I went to graduate school in literature and didn’t write a creative word, but this agent called every few months, just checking in: “Are you thinking about your novel yet? How are you going to carve out time to make that happen?” She encouraged me to apply for MFA fellowships so that I’d have two free years to write. And that’s what I did — I went to the University of Virginia, did an MFA in Fiction Writing, and wrote my first novel. What have been some of the challenges in your writing career? The biggest challenge for me came after I’d written my second novel and was working on a third. A lot of things changed at once — I moved from New York to the suburbs; I had three children in fairly quick succession; I started a full-time teaching job. As a result, I lost the thread of the novel I was working on and couldn’t figure out how to find it. Eventually I abandoned that novel and wrote another very quickly, The Way Life Should Be, which was lighthearted and funny and had recipes. Writing it was a pleasure! 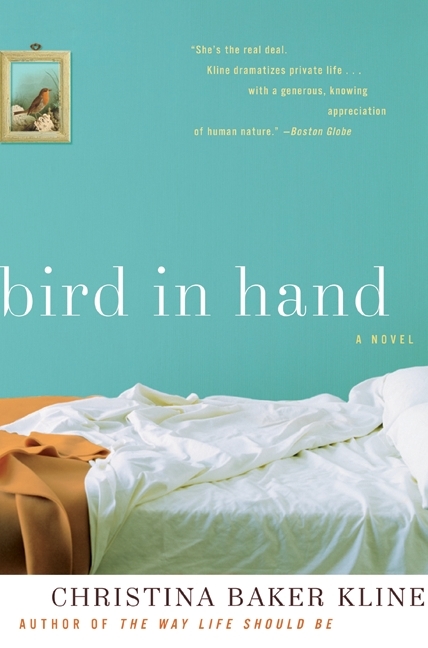 After that, I had the clarity to return to the novel that became Bird in Hand. Though it was a long and difficult process, I learned a lot about myself and my writing in those years. And I think that ultimately Bird in Hand is much stronger for it. I’m working on a new novel that traces the journey of Vivian Daly, a now-90-year-old woman, from a small village in Ireland to the Lower East Side to the Midwest to the coast of Maine. In 1929, after a fire in a New Y tenement destroys her family, nine-year-old Vivian is sent on an orphan train to Minnesota. Stripped of her identity, she has to learn how to survive on her own. She never tells anyone the whole story of what happened to her — until a 17-year-old troubled girl comes into her life when she is an old woman. As Vivian begins to face the truth about what happened long ago, the past becomes more and more present for her. This novel (working title: Orphan Train), should be out in 2011. Well, as I said before, find someone who encourages your writing. Avoid people who are “toxic,” to use an old self-help phrase — people who are competitive with you or otherwise sabotage your writing. Set clear goals for yourself (“I will write a draft of a novel in one year,” “I will write one short story a month”) with daily goals as well. When I’m writing a novel I set myself the task of four pages a day. Sometimes I write more, sometimes less, but that’s always the goal.